Jeff Bezos, the founder of Amazon, gave a talk to a members-only event at the Yale Club in New York on Tuesday. During the 30-minute lecture, Bezos said his private aerospace company, Blue Origin, would launch its first people into space aboard a New Shepard rocket in 2019. Bezos also questioned the capabilities of a space tourism competitor, Virgin Galactic, and criticised the goal of Elon Musk and SpaceX to settle Mars with humans. Ultimately, Bezos said he wants Blue Origin to enable a space-faring civilisation where “a Mark Zuckerberg of space” and “1,000 Mozarts and 1,000 Einsteins” can flourish. Bezos advised the crowd to hold a powerful, personal long-term vision, but to devote “the vast majority of your energy and attention” on shorter-term activities and those ranging up to 2- or 3-year timeframes. 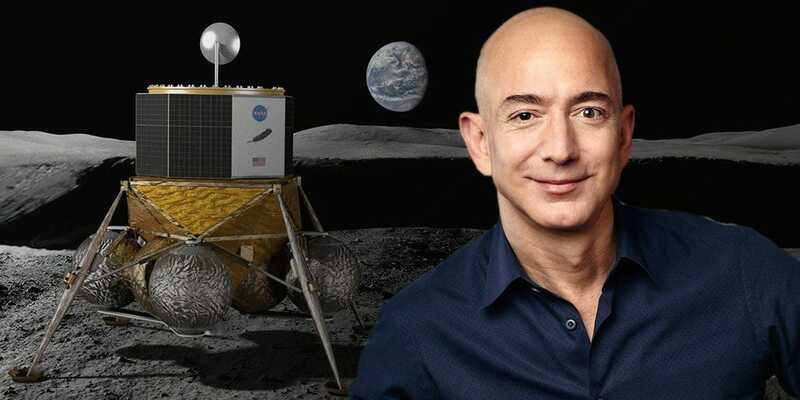 Jeff Bezos may be the richest human on Earth, as the founder of Amazon, but his ultimate dreams reside within a relatively obscure company called Blue Origin. In fact, as Bezos told the CEO of Business Insider’s parent company in April 2018, he liquidates $US1 billion of stock a year to fund his private aerospace outfit. “I believe and I get increasing conviction with every passing year, that Blue Origin, the space company, is the most important work I’m doing,” Bezos said at the time. On Tuesday, Bezos revisited his grand plans for humanity and gave updates on the work that Blue Origin is doing to help realise that vision. This time he spoke during a private event at the Yale Club in New York City. The Wings Club, a professional aviation group, organised the 30-minute lecture, which was moderated by Jeff Foust, a senior staff writer at Space News. 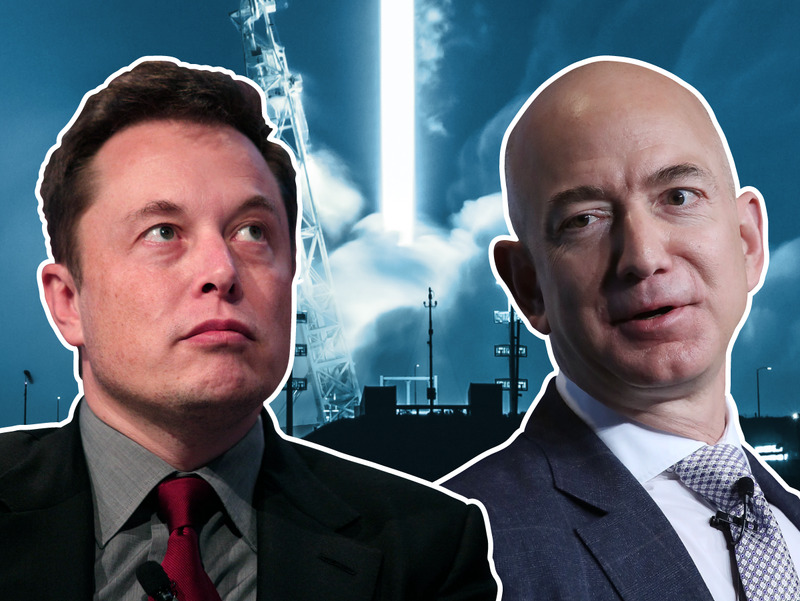 Their conversation covered everything from Blue Origin’s progress on developing 21st-century rocket engines to backstopping the Mars-settling visions of Elon Musk and SpaceX. Bezos even at one point thanked the crowd for shopping at Amazon and the e-commerce companies it owns. Business Insider has transcribed, lightly edited, and highlighted parts of the talk here. Bezos said commercial spaceflight today is expensive because it prioritises reliability, which has the industry stuck on conservative launch systems. He thinks we need more practice to prove the worth and safety of reusable rocket systems. USAF via Wikimedia CommonsEarly in aviation history, barnstormers used aeroplanes for theatrical stunts to entertain crowds. Jeff Foust: The aviation industry is a mature, strong safe industry. 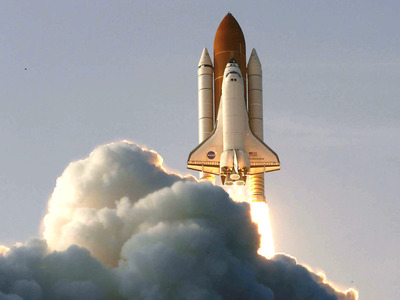 Commercial spaceflight is still well on its way to hitting that goal. Where do you see the parallels between aviation and commercial space, and what role will Blue Origin play in that? Jeff Bezos: I really do think we’re at the barnstorming phase. It’s a very interesting analogue to early aviation, because a lot of industries – new technologies – are first used for entertainment. It’s happened over and over again across industries, and of course, barnstorming was one of the first commercial things that small aircraft could do a long time ago. You see that today. A very prominent case today is in machine learning and artificial intelligence. GPUs [graphics processing units] are instrumental in doing machine learning, but they weren’t invented for machinery – they were invented to play video games. One of the things that I’m very excited about with New Shepard, which is our suborbital tourism vehicle, is using that to get a lot of practice. One of the equilibriums we’re at today with space launch is that we don’t practice enough. The most-flown vehicles may fly a couple dozen times a year launching payloads into orbit. Anything we do just a couple of dozen times a year, you never get really good at. Let’s say that you’re going to have some surgery. You should make sure that the surgeon does that operation at least five times a week. There’s real data that backs up the fact that the practice effect makes that surgery much safer if your surgeon is doing it at least five times a week. And so we need to be going to space very frequently in a very routine way. 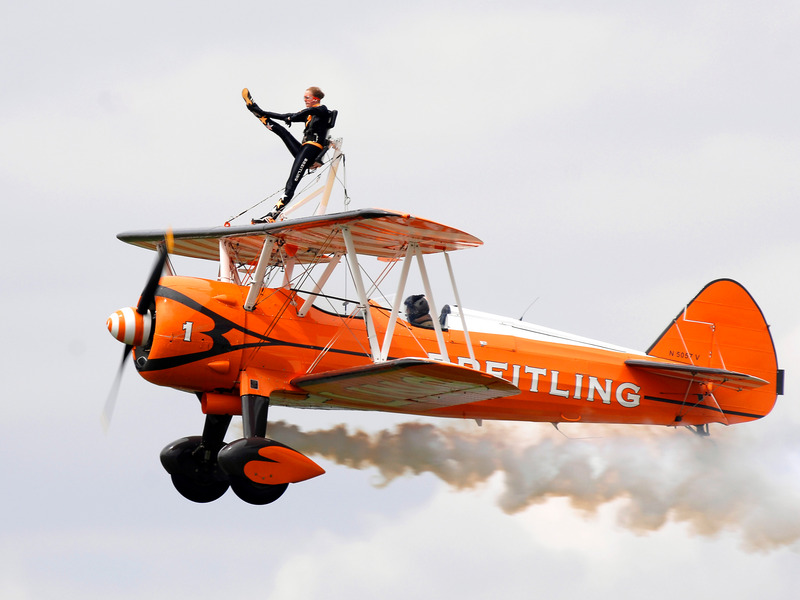 One of the reasons that aviation is so safe today is because we do have so much practice. There are a bunch of reasons why it’s safe – that’s one of them. We need to have [more] missions. If your payloads cost hundreds of millions of dollars, they actually cost more than the launch. It puts a lot of pressure on the launch vehicle not to change, to be very stable; reliability becomes much more important than cost, and it’s hard to get off of that equilibrium. It actually drives you the wrong directions, where you have fewer launches and very expensive satellites, and that’s what you see happening in many cases. Reusable launch system’s aren’t good enough alone, Bezos said. They have to be easy to reuse or costs get too high, negating the point of their existence. NASA Johnson/FlickrOne of NASA’s space shuttles launches toward orbit. Bezos: What we want to do at Blue Origin is try to get on that practice groove, and to do that you have to have an operable reusable vehicle. The key point there is operability. The space shuttle was only reusable in the most [daunting] of senses. In reality, they would bring the space shuttle back, inspect it in very elaborate ways, and then re-fly it. It would have been better to have an expendable vehicle. You can’t fly your 767 [aeroplane] to its destination and then X-ray the whole thing, disassemble it all, and expect to have acceptable costs. And so that reusability is really the key. What we want to do, our goal – you asked, “What is Blue Origin’s goal in this?” – we want to drive down costs using reusability, and the vision is to figure out how there can really be dynamic entrepreneurialism in space. Bezos said he admires that Mark Zuckerberg helped create Facebook in a dorm room using existing internet infrastructure. Bezos thinks “a Mark Zuckerberg of space” can’t exist yet — but that Blue Origin is trying to make that possible. 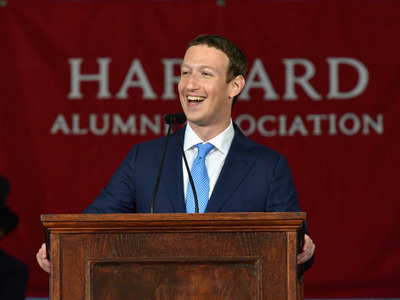 Paul Marotta/Getty ImagesMark Zuckerberg, the founder and CEO of Facebook. Bezos: I’ve witnessed this incredible thing happen on the internet over the last two decades. I started Amazon in my garage 24 years ago – drove packages to the post office myself. Today we have 600,000-plus people, millions and millions of customers, a very large company. How did that happen in such a short period of time? It happened because we didn’t have to do any of the heavy lifting. All of the heavy-lifting infrastructure was already in place for it. There was already a telecommunication network, which became the backbone of the internet. There was already a payment system – it was called the credit card. There was already a transportation network called the US Postal Service, and Royal Mail, and Deutsche Post, all over the world, that could deliver our packages. We didn’t have to build any of that heavy infrastructure. An even more stark example is Facebook. 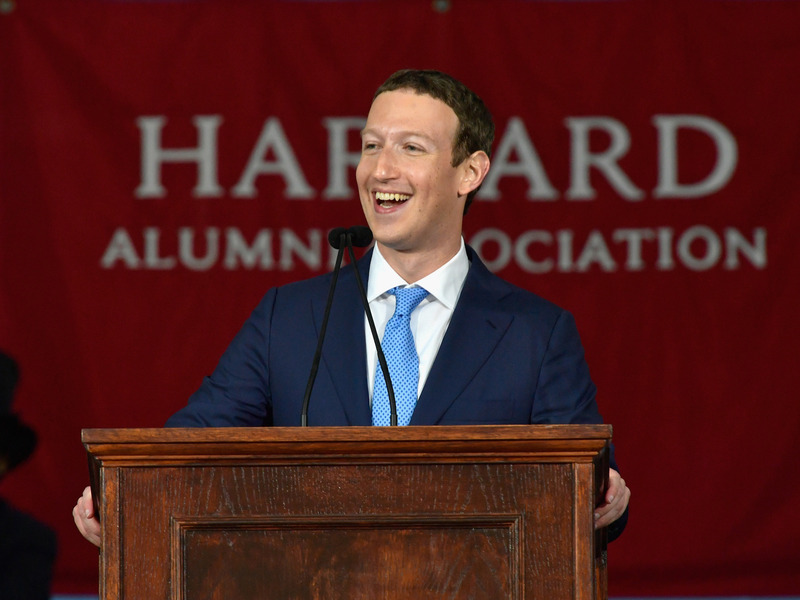 Here’s a guy who literally, in his dorm room, started a company – Mark Zuckerberg started a company in his dorm room, which is now worth half a trillion dollars – less than two decades ago. How do you get that kind of entrepreneurial [advancement] in space? You need to lower the price of admission right now to do anything interesting in space because it requires so much heavy lifting and so much infrastructure development. The entry price point for doing interesting things is hundreds of millions of dollars. Nobody is going to do that in their dorm room. You can’t have a Mark Zuckerberg of space today. It’s impossible. Two kids in their dorm room can’t start anything important in space today. I want to take the assets that I have from Amazon and translate that into the heavy-lifting infrastructure that will [help] the next generation to have dynamic entrepreneurialism in space – kind of build that transportation network. That’s what’s going on, that’s what Blue Origin’s mission is. If we can do that, then the whole thing will take off and there will be thousands of companies doing creative things. New Shepard — a roughly 59-foot-tall space tourism rocket — lands itself back on the ground after launch. But Bezos said that, counterintuitively, it should be easier to reuse bigger rockets, like New Glenn: Blue Origin’s 313-foot-tall launcher that’s designed to lift heavy payloads into orbit. 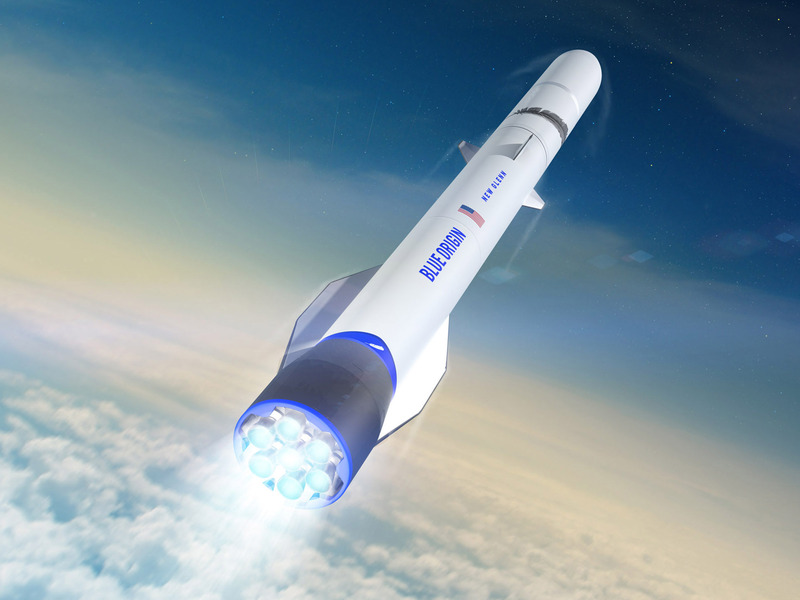 Blue OriginAn illustration of Blue Origin’s New Glenn rocket and orbital launch system. Bezos: By the way, getting into orbit: It turns out there are many creative ways to do that. Once you get into space, you can really unleash a lot of creativity. But the launch itself? I have been through all of the creative ways, and believe me, chemical rockets are the best. And they are actually not just the best, they’re really good – you just can’t throw them away after every flight. New Glenn lifts off with almost 3.9 million pounds of thrust. It uses liquid natural gas and liquid oxygen as its propellants. The propellants to fuel New Glenn cost less than a million dollars. It’s not the fuel: It’s taking all of that high-grade aerospace hardware and throwing it away. You have to design for operability up-front, and so that’s one of the other reasons that we did New Shepard first. We’re taking all of the lessons that we have from New Shepard and incorporating them into New Glenn. The reason we chose vertical landing [of rocket boosters] as our recovery structure is that vertical landing scales really well. In fact, the bigger the vehicle gets, the easier it is to land, because it’s the inverted pendulum problem. When you’re balancing a broomstick on the tip of your finger, that’s doable. Try doing that with a pencil or a toothpick. It doesn’t work because the moment of inertia is just too low. So vertical landing scales really well; the bigger the vehicle, the easier it is. And so New Shepard is the hardest vehicle to land – that we’ll ever have to land. After playing a video of New Shepard’s 10th flight, Bezos said the company will use the rocket to launch its first people into space, although not into orbit, sometime in 2019. Bezos: We’re getting very close to putting humans inside. That’s going to be our barnstorming. Foust: And the goal is to start flying people? We have tested our escape system very successfully, it has performed beautifully in full envelope. We’ve tested high-altitude escape, pad escape, Max Q – maximum dynamic pressure – escape, transonic. So we’ve tested all of the envelopes there for escapes – one of the most complicated things that we’ve done. The booster is performing very well, and we now have two boosters there in Texas for the first time. The reusability… is working very well. So we’re in very good shape. But I do keep reminding the team – and I’m relentless on this – that it’s not a race. We will fly one flight this year – humans, I mean – but we will fly when we’re ready. Almost everything Blue Origin has done with New Shepard, Bezos said, has taught lessons the company will use to refine the New Glenn orbital-class rocket system. 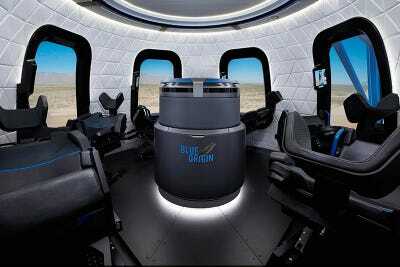 Blue OriginAn illustration of inside Blue Origin’s New Shepard capsule for suborbital space tourists. Foust: What does the future of a New Shepard look like, once you actually start barnstorming and start carrying people, including presumably paying passengers – maybe some of the people in this room – that want to pony up some money to barnstorm? Bezos: The strategic objective of New Shepard is to practice, and a lot of the subcomponents of New Shepard actually get directly reused on the second stage of New Glenn. New Glenn is powered by two vacuum variants of the BE-3 liquid-hydrogen engine, which is the same engine that we fly with… the New Shepard propulsion module. And so all of those systems will get a tremendous amount of practice with that suborbital mission and will be carried over directly to the upper stage [of New Glenn]. And then the lessons learned on things like landing and operability and reusability – all of those things from the New Shepard program – that’s also getting incorporated into the New Glenn booster. When asked about Virgin Galactic, a space tourism company run by Sir Richard Branson, Bezos questioned its capabilities. He said the rival company’s rocket-powered vehicle, SpaceShipTwo, may not go as high as New Shepard — which is beyond the Kármán line, an internationally recognised boundary of space. Virgin Galactic; MarsScientific.com/Trumbull StudiosSpaceShipTwo, or VSS Unity, launches toward the edge of space on December 13, 2018. Foust: Do you think about New Shepard in sort of the competitive landscape? 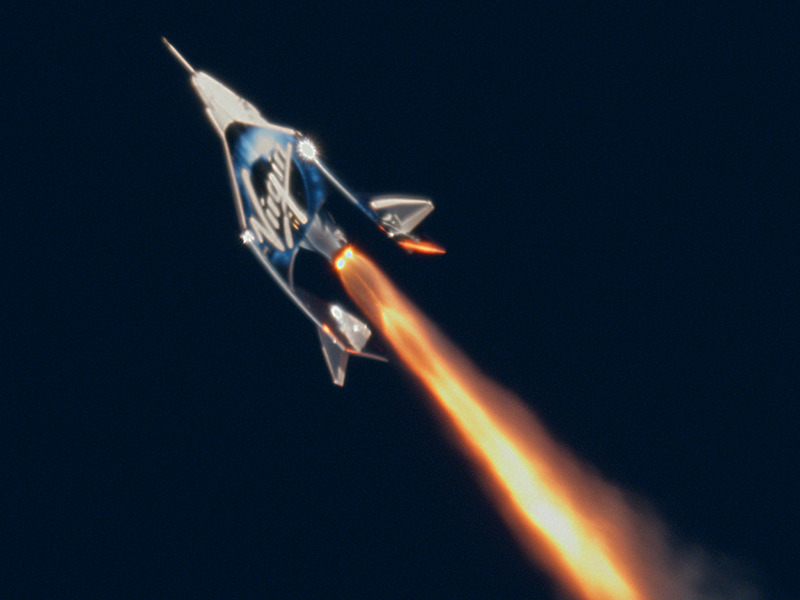 There’s Virgin Galactic, there’s SpaceShipTwo. … Do you think about how that’s going to shake out? Bezos: Yes, I do. One of the issues that Virgin Galactic will have to address, eventually, is that they are not flying above the Kármán line. Not yet. The vehicle isn’t quite capable. So for most of the world, the edge of space is defined as 100 kilometers [62 miles]. In the US it’s different [80 kilometers or 50 miles]. But I think that one of the things that they will have to figure out is how to get above the Kármán line. We fly to 106 kilometers [66 miles]. We’ve always had as our mission that we wanted to fly above the Kármán line, because we didn’t want there to be any asterisks next to your name about whether you’re an astronaut. And so that’s something they’re going to have to address, in my opinion. Foust: So with you flying New Shepard, you’ll definitely be above that 100 kilometers, no asterisk? Rockets don’t go anywhere without rocket engines, and Blue Origin is developing and testing a very large, powerful, and reusable one called the BE-4. It’s not just for New Glenn, though; competitors are buying the devices, too. 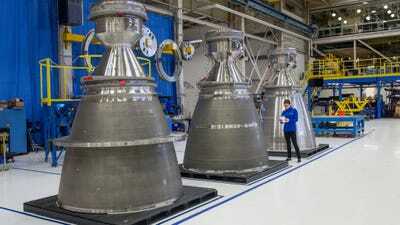 Blue OriginBlue Origin’s towering BE-4 rocket engines on a factory floor. Foust: You mentioned that New Shepard is a stepping stone to orbital ambitions. You’re working on the New Glenn launch vehicle, and sort of the building block, that BE-4 engine. How is the work on the BE-4 going? Bezos: Really well. It has 1,800 seconds of test time on it. It’s been up to 400,000 pounds of thrust. The full trust on that engine is 550,000 pounds of thrust. It’s liquefied natural gas as fuel, liquid oxygen as oxidizer, uses an oxygen-rich staged combustion cycle. It’s a very advanced engine – it’s kind of a 21st-century, we want it to be a 21st-century American engine – kind of the new version of the F-1. It’s not only going to be used in the New Glenn orbital launch vehicle, but it’s also going to be used in United Launch Alliance’s Vulcan launch vehicle. So we’re building a facility to manufacture those engines in Alabama right now, in Huntsville. We’re also going to build the upper-stage variant of the BE-3 there, and when that’s up and running at full capacity, we’ll be building dozens of engines a year. We’re building a big manufacturing facility that’s already largely complete in Florida to build New Glenn. Bezos walked his audience through the particulars of the BE-4 engine test program by playing a compilation of test footage. Bezos: This is our test stand in West Texas. You can see the shock diamonds [turn] blue as we throttle the engine. The engine is designed to throttle all the way down to 40%, which is a very challenging thing to do … but it’s very useful for soft vertical landings. He also showed an animation of the New Glenn rocket system at work, highlighting technical details along the way. Bezos: Why don’t we go ahead and roll the New Glenn animation so we can see what that will look like when it’s operational in 2021. The vehicle goes out to the pad in a horizontal configuration. Those are the… landing gear, that’s when we have landing gear out – a capability to land with landing gear. The vehicle has fins [and wing-like strakes] on the booster stage… so that it can more easily get back to the landing ship. The colour of the flame is a little bit blue because of that liquefied natural gas as the fuel. The fins there you see on the forward part of the booster stage are for guiding the vehicle in the reentry stage. There’s the second stage firing two BE-3 engines. Fairing separation. Here comes the booster stage. There are seven BE-4 engines – 3.85 million pounds of thrust. Decelerates, and lands on a booster moving ship. It’s taken 10 years of renovations to turn it into a landing ship. The ship will be moving… We want to be able to operate even in heavy sea states. Our requirement is that this vehicle should be able to fly anytime they’re flying aeroplanes out of the Orlando airport. And there’s a payload deployment. The second stage is expendable. Foust asked Bezos about the peculiar arrangement of supplying BE-4 engines to a competitor. Bezos explained that such a thing is not unusual in many industries and how it can benefit Blue Origin. United Launch Alliance/YouTubeAn illustration of United Launch Alliance’s next-generation Vulcan rocket in flight. 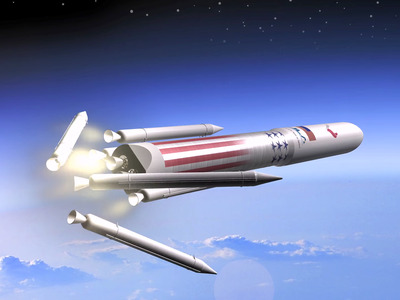 Foust: You mentioned that besides developing the BE-4 for New Glenn, it will be used in Vulcan. What’s that relationship like being both a vendor to a company but also a competitor? Bezos: Pretty normal. In this industry, there’s a lot of… You’re a competitor in one way, and you’re often a customer and a vendor in another way. It’s not atypical in aerospace. Actually, it’s not that atypical in a lot of industries. Foust: So no qualms about either? Bezos: No. They bid us very aggressively against Aerojet-Rocketdyne as their other possibility for acquiring engines for the Vulcan vehicle. And after that very aggressive process, they chose our engine. We’re very grateful for that, and we’re going to bust our butts to make a great engine for them. Foust: And you get benefits in terms of economy of scale? Bezos: Absolutely. With the amount of fixed expense that goes into developing something like the BE-4 engine, you want it to be used as much as possible. You want to amortize that fixed development cost across as many programs as you can. Reusable rockets require a lot of infrastructure before they can launch — factories, launch pads, drone ships (to catch building-size boosters), and other facilities. Bezos said Blue Origin is on track for a 2021 debut of New Glenn in Florida. 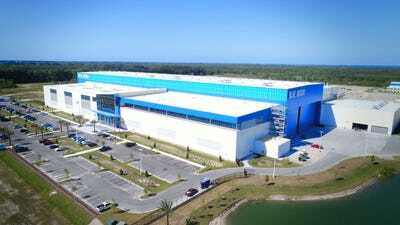 Blue OriginBlue Origin’s 750,000-square-foot New Glenn rocket manufacturing facility in Cape Canaveral, Florida. Foust: You mentioned that you’ve got the landing ship being renovated right now. What about the launch vehicle, the launch site? Bezos: Yeah. All of those things are under construction. When it’s said and done, we’ll have invested about a billion dollars between the manufacturing facility and the launch facility at Cape Canaveral. We’ve also got a $US500 million contract from the Air Force. That’s going to help us build launch facilities, for example, in Vandenberg. Foust: So you’re targeting to do New Glenn launches in 2021, and you’ve already started to sign customers for that? Bezos: Yeah, most recently Telesat. But yeah, we’re building a backlog for that vehicle right now. The industry is very hungry for additional launch providers. Blue Origin is aware it has some competition from the likes of SpaceX’s Falcon Heavy and, in the future, ULA’s Vulcan. SpaceX is also developing a larger and more reusable launcher called Starship. Bezos said New Glenn will stand out with its ability to take a huge amount of volume into space, and be reusable dozens of times. Foust: You must be under a lot of competition with other vehicles under development. How does New Glenn stand out in the crowd? Bezos: Well, a couple of ways. One very big way is the 7-meter [23-feet] diameter payload fairing. It’s the largest payload fairing in the industry, by far. That is, especially for certain missions – including LEO [low-Earth orbit] constellations – that is a big deal. Because a lot of those missions end up constrained more by volume than by mass. So it’s a fairly large vehicle, geometrically, and it’s also very large in terms of lifting payload. So 45 metric tonnes to LEO, 13 metric tonnes to geosynchronous transfer orbit, which lets us take two heavy satellites on one mission. Foust: And what about cost? Bezos: We’ll be very competitive on cost. We’re trying to build the market-leading vehicle in that way. And that’s what people want to do – that’s the whole point of doing this. Another way that we are very different from anybody else out there, in terms of our approach to reusability, is we’re designing – from the beginning – for a very high mission life on that booster. And that’s based on our experience with designing and operating the New Shepard vehicle. Foust: How many re-flights for that first [New Glenn] vehicle? Bezos: At least 25 before we need to do serious refurbishment. When Bezos’ long-term vision for spaceflight was brought up, he criticised the idea of settling Mars — the dream of Elon Musk and his aerospace company. Samantha Lee/Business InsiderElon Musk of SpaceX and Jeff Bezos of Blue Origin are caught in a new space race featuring reusable rocket systems. Foust: You have a big vision of millions of people working and living in space. So there’s got to be more steps beyond – what’s down the road? Bezos: I already talked a little bit about unleashing entrepreneurialism in space, and that is really critical. If you look even further beyond that, or ask a big question, “Why do we need to go to space? Why do humans need to go to space? What’s that all about?” I think that is a very useful question to ponder. My answer is a little different from the answer that I think you hear sometimes more commonly. One thing I find very un-motivating is the kind of “Plan B” argument, where the Earth gets destroyed, where you want to be somewhere else. That I find very little… It doesn’t work for me. He added that his vision is to move heavy industry and energy generation off-Earth. That way our planet starts pristine and we don’t have to suffer through shortages and rationing as populations grow and people increasingly live first-world lifestyles. 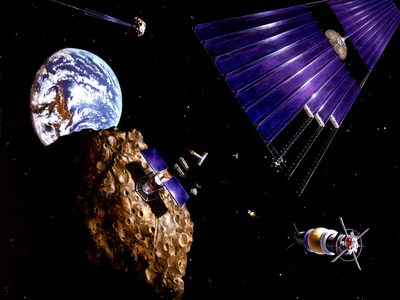 NASAAn illustration of an asteroid-mining operation. Bezos: We want to go to space to protect this planet. That’s why the company’s named Blue Origin – it’s the blue planet that’s where we’re from. But we also don’t want to face a civilisation of stasis, and that is the real issue if we just stay on this planet – that’s the long-term issue. This planet is actually finite. People have been predicting that the planet is finite for a long time, and they have always been wrong, seemingly. You can go back decades and people have predictions that we’re going to run out of this mineral or that mineral, and it hasn’t turned out to be true. But you can take something very fundamental, which is the amount of solar energy that this planet intercepts. This is a tiny little planet circling the sun, and the sun broadcasts energy everywhere. The sun is a nuclear fusion reactor very conveniently provided for us. And it not only broadcasts, it produces fusion energy for us, it broadcasts it everywhere. But we’re only intercepting a tiny little bit of it. If you take current baseline energy usage, globally, and compound it at just a few per cent a year for just a few hundred years, you have to cover the entire surface of the Earth in solar cells. That’s the power of compounding. And by the way, we have been compounding energy at that rate for hundreds of years. Everybody on this planet is going to want to be a first-world citizen using first-world amounts of energy, and the people who are first-world citizens today using first-world amounts of energy? We’re going to want to use even more energy. A life of stasis would be population control combined with energy rationing. That is the stasis world that you live in if you stay. And even with improvements in efficiency, you’ll still have to ration energy use. And that to me doesn’t sound like a very exciting civilisation for our grandchildren’s grandchildren. This isn’t for us, it doesn’t matter for us – we’ll be fine. But for them, that to me seems like a pretty bleak world. We don’t have to have that. Bezos explained some of the surprising benefits he sees in populating the solar system with 1 trillion people instead of just a few billion limited to Earth. 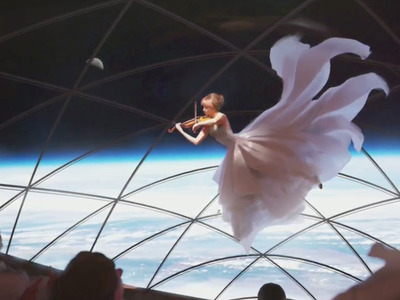 SpaceXAn illustration by SpaceX of a musical performance in low-Earth orbit. Bezos: The solar system can support a trillion humans, and then we’d have 1,000 Mozarts, and 1,000 Einsteins. Think how incredible and dynamic that civilisation will be. But if we’re going to have that, we do have to go out into the solar system. You have to capture more of the sun’s output, and we have to use all of the resources that are out in space, in terms of minerals and not just energy. And that’s very doable, but we have to get started. The fact of the matter is we don’t have forever, and the first step – I don’t know all future steps – but I know one of them is we need to build a low-cost, highly operable, reusable launch vehicle. No matter which path you take, it has to go through that gate. That’s a very expensive step. That’s why Blue Origin is focused on it. It’s not something that two kids in a dorm room are going to do. But I really want that dynamic life and civilisation for our grandchildren’s grandchildren. But we’ve got to get started. If his plan works, Bezos explained that we don’t need to be ‘planet chauvinists’ and settle worlds in the solar system. Instead, he thinks we can build our own habitats, as physicist Gerard O’Neill characterised them in the 1970s. Rick Guidice/NASA Ames Research CenterA 1970s illustration by NASA of a cylindrical space colony, complete with rivers and lush green parks. Bezos: I don’t think we’ll live on planets, by the way. 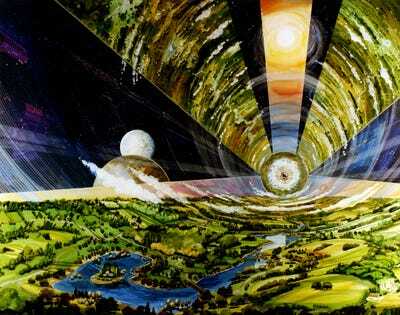 I think we’ll live in giant O’Neal-style space colonies. Gerard O’Neil, decades ago, came up with this idea. But the space colonies we’ll build will have many advantages. The primary one is that they will be close to Earth. The transit time and the amount of energy required to move between planets is so high. But if you have giant space colonies that are energetically close and, in terms of travel time close to Earth, then people will be able to come and go. Very few people are going to want to leave this planet permanently – it’s just too amazing. Ultimately what will happen, is this planet will be zoned residential and light industry. We’ll have universities here and so on, but we won’t do heavy industry here. Why would we? This is the gem of the solar system. Why would we do heavy industry here? It’s nonsense. And so over time – of course you have to today – but over time that transition will happen very naturally. It will even be the business-smart thing to do because the energy and resources will be so much cheaper off-planet that industries will naturally gravitate to those lower-cost environments. With such an epic vision for humanity’s future, Bezos was asked how he doesn’t get distracted by other work. He responded by thanking the audience for buying products — that funds Blue Origin, he said— and advised everyone to create a grand, long-term vision, but to spend most of their time and energy on much shorter-term work. Foust: This is a tremendous long-term vision. How do you stay focused on that when there’s all the day-to-day distractions? When have an e-commerce company? Bezos: Which also, by the way, is the business model for Blue Origin right now, so it’s very important. Every time you buy shoes, you’re helping fund Blue Origin, so thank you. I appreciate it very much. It’s actually not hard. Vision is absolutely important, but it doesn’t deserve your day-to-day attention. You need a vision, then, that’s a touchstone: It’s something you can always come back to if you ever get confused. But mostly, your time should be spent on things that are happening today, this year, maybe in the next 2 or 3 years. It doesn’t take a lot of time to focus on things that are too far – you might have with a few things that are 5 to 7 years out. I try to organise my personal time so that I live mostly about 2 to 3 years out. We’ll announce our Amazon quarterly results, and [people will say], “Great quarter, congratulations!” And then I say, “Thank you.” But what I really think about is [how] that quarter was kind of baked and done 2 or 3 years ago, and right now the senior executives at Amazon are working on a quarter that’s going to happen in 2021, 2022 – that kind of thing. So I would always encourage people to hold, powerfully, a vision and be so stubborn of it. Don’t let anybody move you off of your vision. But put the vast majority of your energy and attention on things that are in a kind of 2- to 3-year timeframe. Then the sub-division will be a kind of emotional guide to that – the gut intuition guide – to those more near-term activities.